US, 1950, 67 minutes, Black and white. Charles Mc Graw, Adele Jergens, William Talman, Douglas Fowley, Steve Brodie. 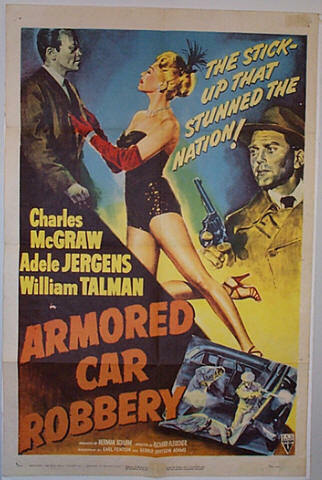 Armored Car Robbery is a small-budget, short running time second feature from 1950. It plays very much like a contemporary television episode – the successes of this kind of supporting feature. Director Richard Fleischer also made The Narrow Margin at this time with Charles Mc Graw. It is considered something of a classic. The influence of films and television series like The Naked City is very much in evidence. The cast is second-drawer, Charles Mc Graw often being a criminal and too familiar a criminal-looking face to be always a convincing policeman. William Talman is the self-confident criminal. Adele Jergens is the femme fatale, blonde style. Nothing new but an interesting look at a style of film-making around 1950. 1.The impact of this kind of film? Brief, B-budget? The parallel to television episodes of crime series? 2.Los Angeles, the black and white photography, an authentic atmosphere, 1950? Musical score? 3.The title, the focus on the robbery, the planning, the execution? Inevitable mistakes? The pursuit by the police? 4.The set-up: Dave Purvis and his pressure on Benny, the planning of the robbery? Their success in the past? His personality? Benny as a loser, his relationship with his wife and the break-up, her two-timing him with Purvis? The meeting with the men, the discussions of the plan, their initial scepticism, his reputation? The planning? The details of the execution, the build-up, the mistakes? The pursuit by Cordell, the unmasking? The pursuit and the solving of the crime? Purvis as a strong character – yet able to make mistakes? 5.The other members of the group, Benny and the pressure on him, his debts? His wife? Her betrayal? The other members of the gang? Doing their job? Not completely trustworthy, loose lips, mistakes? 6.The picture of Cordell, the police, their work? His assistants? The detection, the follow-through, the pursuit, success? 7.The dancer, her marriage to Benny, her double-crossing him, the relationship with Purvis? The interrogations? Her losing out? 8.The popularity of this kind of film at the time – and the admiration of critics later?